“Meet me at the Loveless,” he said, and I agreed. The idea was to meet on his side of town, have brunch, and go on a motorcycle ride. I had only been on a motorcycle once before so it was kind of a big deal. The Loveless, in case you don’t know, is a Nashville icon. It is actually in a tiny town called Pasquo south of Nashville, but we still claim it as our own. It used to be the Loveless Motel – now it is the Loveless Cafe. They are known for fried chicken and ham and other country cooking, including their famous biscuits. I couldn’t wait. We met at about 11:30. It was a Sunday. A beautiful fall day. Seemed like a great plan until we realized how packed the Loveless was and that we would never get a table. I stifled my disappointment as we made a quick run to the gas station next door to get BBQ as a substitute. Yes, that is what I said. We went to the gas station to get a BBQ lunch. Gotta love Tennessee. We both cracked up. It is over a year later and I still have not had a biscuit from the Loveless. He now says we won’t go to eat there until I move to his side of town. I have to admit – it IS an incentive. He did bend the rules slightly and buy me a bag of their mix so that I could make my own biscuits. The mix is pretty good, but I’m holding out for the real thing. He still owes me a biscuit. Nice, but not the same as a biscuit. 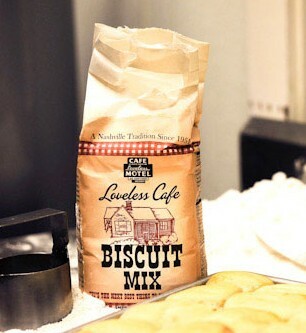 This entry was posted in Musings and tagged famous biscuits, loveless cafe, loveless motel, nashville icon. Bookmark the permalink.